Invite your friends and family...have some laughs...and create your very own work of art! Artistic talent is NOT required. Really! 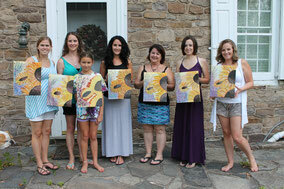 I guide the group, step by step, through the creation of the painting...from how to hold the brushes to how to make each stroke. 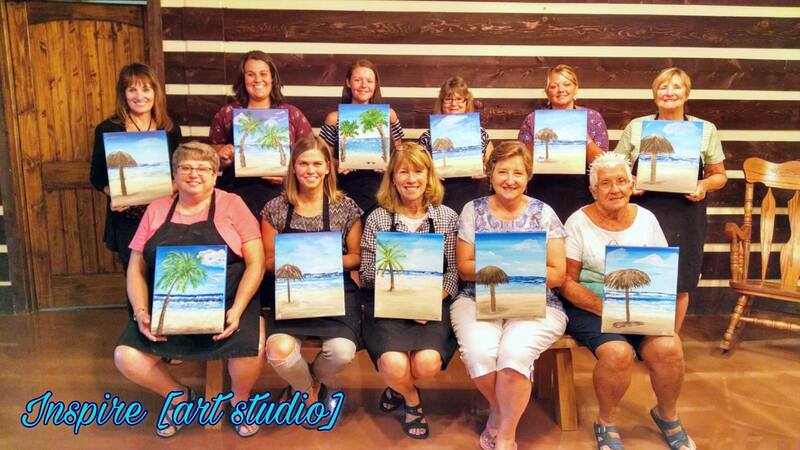 Everyone's painting will look different in the same way everyone's handwriting is different. No right or wrong way to do it! 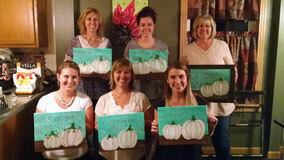 Private events are booked by a host/hostess. Fill out the form below to book your party today. If you are interested in a fundraiser, just jump over to this page for more information. 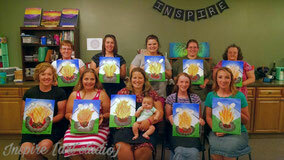 If you would like to have your party at Inspire [art studio]... it's only $25 per guest! Collecting cash or check payments and submitting payment to me no later than two weeks before the event. Hostess benefits will be void for payments that are late, without prior notification and approval. In the event the party is too small to qualify for hostess benefits, a fee will be charged in the amount equivalent to the ticket price. The studio. It will be all set up with covered tables, chairs and supplies. If you would like me to come to your location... prices start at $30 per guest. Mess-proofing the space as you see fit, with tablecloths, drop cloths, etc. 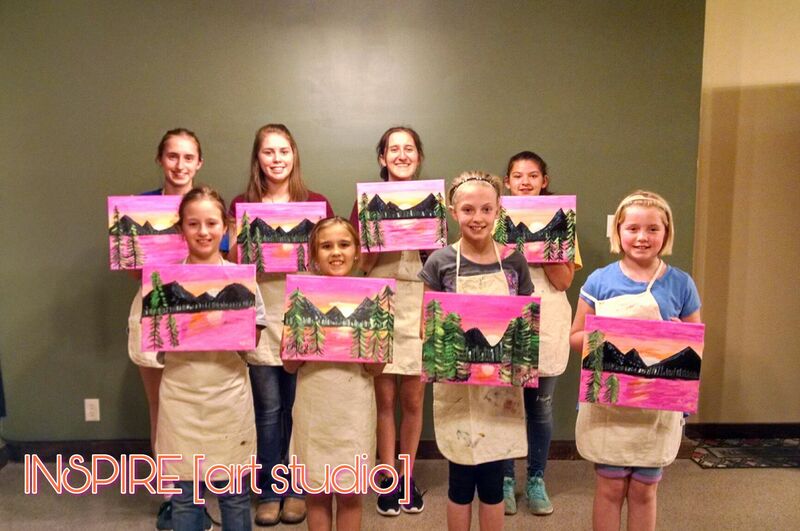 Book a party with 5 guests or more and the host/hostess paints for FREE! If a guest books a party at your party, you get a FREE frame!! *On-location ticket prices are based on location and range from $30.00 per person for local groups to $45.00 per person for Philadelphia area groups. "Local" is considered to be within an 18 mile radius of my home. *If the payment is late without prior notification by the host/hostess and approval by Rachel Miller, hostess benefits are void. *If the payment is not received before due date, without prior notification and approval, the party will be canceled and the date will be available for someone else. *Pictures will be taken at the the event and shared on this website and social media. By attending, you agree to be photographed. This should also be communicated to the guests by the host/hostess. *Snow/Ice Policy: A workshop can be rescheduled by Rachel E Miller Art up to 3 hours before the event due to extreme weather. Extreme weather is classified by an instructor not being able to safely get to AND/OR from your location. If this happens, the party will be rescheduled. Sorry, no refunds. If you would like to book a party, please fill out the booking contract below. 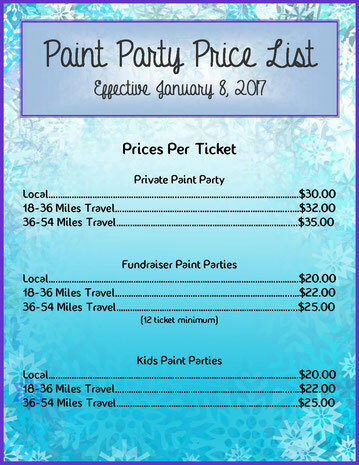 Choose an estimated date you would like to have your party. This date may or may not be available, but it will give us a starting point. What time of day would you like to start the party?